CPC Shipyard in Digoin, Burgundy, France specialises in building canal boats with polyester hulls. We have a wide selection of six ranges on offer, with 25 models in all, ranging from fishing boats (La Digoinaise) to passenger vessels (Wanday, Miss 1150 TP). Our main activity nevertheless remains building river boats for rental or private use (Tarpon, Pénich, Triston, Espade and Fred). And since all clients are different, we have designed a range of boats accessible to people with reduced mobility (Espade 1230 handy and Triton 1060 handy) and a range of unusual floating accommodation which is environmentally friendly (Toue Cabanée and Fredaine). The strong partnership between the CPC shipyard and the Canalous Rental Company, a major player in French river tourism along with the team’s passion for sailing, means we improve our boats regularly based on our users’ suggestions and technical evolution. 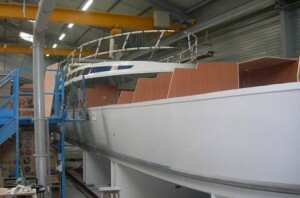 We therefore dispose of modern, spacious and comfortable boats. Proud of our boats made in Burgundy! From the manufacturing of the hulls to the interior wooden or polyester fittings, each boat is entirely designed in Digoin by our team of carpenters and cabinet makers and has been for almost 30 years.